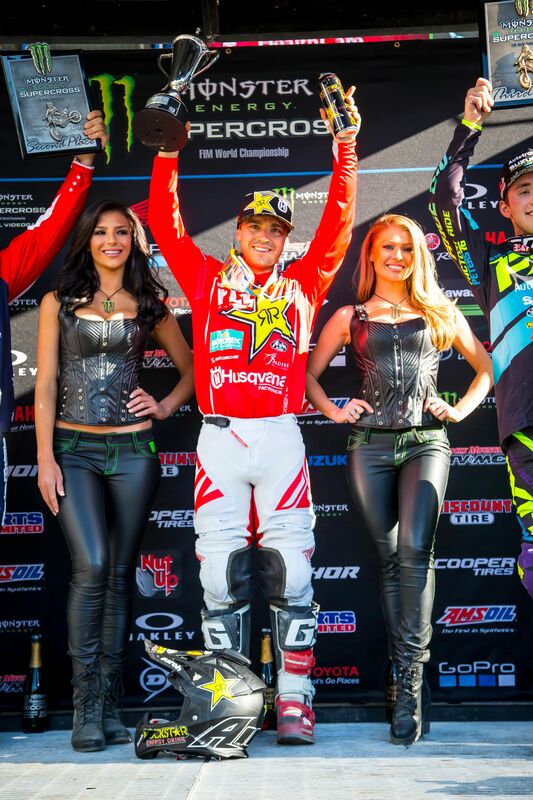 HomeNewsROCKSTAR ENERGY HUSQVARNA FACTORY RACING’S ZACH OSBORNE SHINES WITH A VICTORY AT FOXBOROUGH SX! April 22, 2018 Michael Le Pard News Comments Off on ROCKSTAR ENERGY HUSQVARNA FACTORY RACING’S ZACH OSBORNE SHINES WITH A VICTORY AT FOXBOROUGH SX! The Rockstar Energy Husqvarna Factory Racing Team invaded New England Patriot territory for the 15th round of AMA Supercross, held at Gillette Stadium in Foxborough, Mass. on Saturday. Despite a deteriorating and rutted track, Zach Osborne had a shining moment by earning another victory to extend his points lead in the 250SX East class, while teammate Jason Anderson kept a cool head and rode to a solid third-place finish to hold on to the 450 red plate. Dean Wilson had a consistent night and impressed with a fifth-place finish, while Michael Mosiman pushed through a tough night but is motivated to make a rebound. Zach Osborne pulled the holeshot in his 250SX East heat and dominated the remainder of the race to take the win and transfer to the Main Event. He pulled another holeshot at the start of the Main and worked hard to pull a gap. He stayed consistent despite the rutted track and maintained the lead. He led every lap and cruised to his seventh career victory to maintain his lead in the 250SX East Championship. Osborne will lay it all on the line as he heads to the series finale in two weeks in Las Vegas with a 15 point lead. Jason Anderson pulled the holeshot in his heat and held his ground to take the win and transfer to the 450 Main Event. He was top-five at the start of the 450 Main and battled with a freight train of riders up front. He maintained his position in third and focused on staying consistent in order to get a good finish to maintain his lead in the 450 championship. He had a clean finish in third, and maintains his lead in the 450 championship as the series heads to its penultimate round next Saturday. Dean Wilson was top-10 at the start of his 450 heat and came out of the first lap in eighth. He navigated his way into a seventh-place finish to earn a direct ticket to the 450 Main Event. He started in the top-10 in the 450 Main and had a good run in sixth. He stayed focused and made the pass for fifth in the eighth lap then stayed consistent to finish fifth. He is currently eighth in 450 rider point standings. Michael Mosiman started in the top-10 in his heat and started making passes to move through the pack. He quickly got into the fifth-place spot and was on the gas. He made one more pass and he held strong to finish fourth and transfer to the 250 SX East Main Event. He was top-10 at the start of the Main and came out of the first lap in seventh. He was putting on a charge but then went down in the third lap and was forced to work his way back up through the pack after remounting in 17th. Having his work cut out for him, he immediately started making up for lost ground and charged up to 13th by the fifth lap. He was flowing and looking strong until he flew through the whoops in the sixth lap and suffered a hard crash.